Tag Archive | "Erwin D. Fox"
Erwin D. Fox, 87 of Sand Lake, died Monday, August 25, 2014 at his home. Erwin was born July 19, 1927 in Comstock Park, Michigan the son of Leon and Thelma (Geer) Fox. 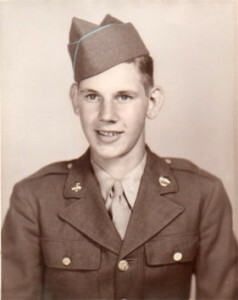 He served his country in the U.S. Army during the Korean War. He was a mechanic and worked many years for C.H. Wallace Pontiac. Erwin enjoyed hunting, fishing, dancing, snowmobiling and chopping wood. He was a member of the North Kent Snowmobile Club. Surviving are his wife, Marjory; children, Dennis (Laura) Smith, Linda (Don) Vandenberg, Carolyn (Greg) Wagner, Kurt Fox, Susan Fox; 13 grandchildren; 28 great grandchildren; one great great grandson; sister, Yvonne Brownell; brother-in-law, Donald Seaborn. He was preceded in death by two sisters and one brother. The family will greet friends Thursday, August 28 from 12 noon until time of service at 1:00 pm at the Bliss-Witters & Pike Funeral Home, Cedar Springs. Pastor Tuttle officiating. Interment with military honors at Solon Township Cemetery. Memorial contributions may be made to the family to help with final expenses.